Lilac Lodge & Lavender Cottage are sister homes located in the same road in the village of Oulton Broad, known as ‘the gateway to the Broads’, with its easy access to popular boating areas. Both homes benefit from pleasant, relaxing grounds and a peaceful and sedate village setting. These homes offer person-centred residential and dementia care for 34 residents, with respite care also offered subject to availability. Explore the services provided at Lilac Lodge & Lavender Cottage, which are designed to make every resident’s stay a pleasant one. At Lilac Lodge & Lavender Cottage, the first and foremost point we stress is that this is the residents’ home. Therefore all residents are encouraged to furnish and decorate their rooms in the way they want to. These rooms are residents’ personal space and we want them to feel happy in it. Secondly but no less importantly, residents are free to move around the home as they please – again this is their home. We have a wide variety of high-quality, comfortable rooms including conservatory, lounges, diners, patio areas and pleasant, interesting gardens to enjoy. There are also themed corridors and sensory areas, aimed at stimulating thought, conversation and interaction. At Kingsley we place paramount importance on the needs, wishes and happiness of our residents. Take a look at ‘Location and features’ and the 360o tour of the home to find out more. Kingsley Healthcare’s truly person-centred approach to care creates a positive outlook and focuses on quality of life and relationships. We place much importance on the lives our residents have led, and spend time with them and family members to find out about their tastes, history, hobbies and interests. The information gained helps us to create individual care plans for each individual, which are paramount in providing the best care, and also of course, helps us get to know your loved one well. Residents are supported to achieve their aspirations and dreams by taking part in meetings, surveys and one-to-ones. Lilac Lodge and Lavender Cottage are established homes within the Kingsley Healthcare group and were quick to embrace the group ethos of ‘person-centred care’. The unique person centred approach is much appreciated by the residents who live with us, all of whom require residential or specialist dementia care. Its success is due to our staff’s continuing commitment to specialist training, which supports the individual to express their needs and maintain a high level of self-worth and well-being. The experience of individuals living here is that of love, achievement, well-being, encouragement and fulfilment. The staff are all of a kind and caring nature, they understand the meaning of real person-centred care and are skilled in engaging residents in meaningful activities. Each Kingsley care home is unique, but we all have a set of highly respected features embedded within the culture, and the way we care for our residents makes a big difference in their lives. Our daily emphasis is on the care that our residents need, whether that be physical, emotional, spiritual or mental. We support our residents in maintaining their independence as much as possible, so embrace and encourage ways in which they can do this. We are committed to providing the best possible outcomes for people living with a dementia, and we achieve this through our ‘Wings’ (Welcome, Individuality, Nurturing, Guidance, Sensitivity) philosophy of care. This award-winning approach is nationally recognized and our bespoke learning programme is designed to ensure that the person with a dementia is at the heart of everything we do. Both parts of the home are designed to be dementia friendly, and Lavender Cottage is especially converted to cater for those with a dementia. Family and friends are significant partners with the home (as with all Kingsley homes) and are welcome to come and go as they please throughout the day. We listen to the people who live with us and to their families about the services we provide. Just as there is no typical Kingsley home, there is no typical day in a Kingsley home. We actively encourage people to take part in the daily and extra activities which help to keep life fun and interesting, but there are opportunities to do as much or as little as people wish. Our care is focused around each person’s individual needs and wishes and we value and respect how each person chooses to spend their day. Residents can rise whenever they like at the home and have a choice between hot and cold breakfasts. They can even have breakfast in bed if they like, but most enjoy the communal, friendly dining room. Staff eat with the residents and don’t wear uniforms or badges, which adds to the relaxed, homely feel of mealtimes. Breakfast is followed by an optional programme of activities, individually tailored to each resident, based on their likes and dislikes. These include regular visits from hairdresser, chiropodist and therapists; health and well-being sessions; movement and music; exercise and dance; flower arranging, skittles, jigsaw puzzles, books and many others. There are organised and impromptu trips throughout the year including cinema nights, theatre, concerts, sing-alongs, summer BBQs, themed events, as well as all the usual annual celebrations such as birthdays, Christmas and Easter. Alternatively residents can spend time with family, relax in one of the spacious communal areas or in their room, watch TV, read a newspaper in the garden, play games, have one-to-one time with staff or chat with other residents – the choice is indeed, theirs. Families and friends are welcomed at all times of day and residents are encouraged to maintain social contacts prior to life at Lilac Lodge and Lavender Cottage. The committed, caring staff are always on hand to be with residents if needed, at any time throughout the day. For lunch there is a choice of mains and desserts, and we invite the residents to help set the tables. All food is cooked on the premises and is made both with health and taste in mind – menus are available on request. Mealtimes are a sociable time, and staff are skilled at getting even the quietest residents involved in activities and conversations. Staff are encouraged to be proactive, to swap stories, to laugh and cry with the residents, whilst residents are encouraged to follow their own interests and make their own decisions. They may want to listen to their favourite music, have some ‘me time’ or share their experiences with others. We want them to relax and feel at home, without conforming to routines. Supper time is a choice of hot or cold food, with at least two choices of main and dessert. After supper, residents can opt to go to bed early, or stay up until later relaxing in one of the communal areas or in their rooms. There are hot and cold drinks, alcohol available to those that want it, and NO set bed time, as this is their home. We encourage all our residents to live as healthily as possible, to aid long and pleasant lives. Where possible we encourage exercise, keeping minds active and eating nutritious food. Our healthy, balanced meals are made from scratch in our kitchen using only the best ingredients. We understand that people’s tastes and habits are different, and the varied menu and choices include a great selection of nutritious delights and tasty favourites, sure to bring a smile to everyone’s face. Residents often make suggestions for the menu, and we like to ensure that individuals’ favourites are featured regularly. Situated on Gorleston Road, the home is in the heart of Oulton Broad village, which is less than a mile from the Broads, minutes from the railway station and just three miles from Lowestoft and beaches. The home caters for 34 residents in total and serves the wider community around this sought-after area, including Lowestoft, Corton, Beccles, Kessingland and Somerleyton. Lilac Lodge has been thoughtfully extended and has a conservatory and courtyard sensory gardens. It has a variety of lovely rooms which include a lounge, a dining room and a multi-sensory room, which provides a stimulating yet calming atmosphere for all to enjoy. Residents also have access to established, mature gardens, a vegetable patch and patio areas. There is a lift to all floors. Lavender Cottage is a comfortable, homely bungalow offering a safe and nurturing environment for eight residents with dementia care needs. It has extensive gardens featuring grass lawn, sensory stimuli, chicken coop, greenhouse and patio area. Visit us virtually – Take a 360° virtual tour and get a feeling of Lilac Lodge & Lavender Cottage. We actively encourage those who are considering living here to visit and spend some time at the home to gain an accurate perception of the care we offer. It will give you an opportunity to meet the team and ask any questions you may have. The home manager will be more than happy to show you around and introduce you to everyone. We pride ourselves on our attentive and enthusiastic team which works very well together. 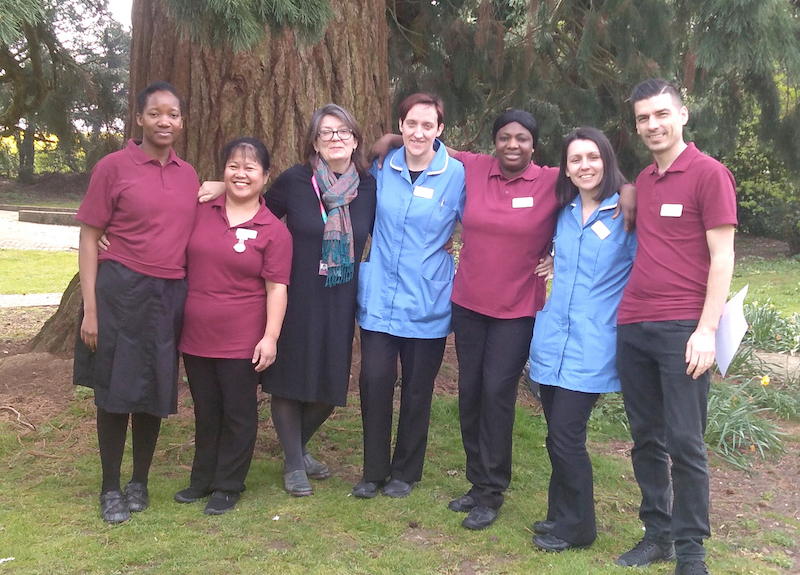 The team is selected through a very thorough recruitment process, which gives us reassurance that the staff supporting our residents have their hearts in the right place. Staff go through a very intensive induction training, where they are supported and helped to overcome any difficulties they might come across. The team looks after our residents with emphasis on quality of life, and we strive to give purpose to every single day. Hanna joined the home in 2008 and hadn’t worked anywhere previously. Hanna joined the home in 2008 and hadn’t worked anywhere previously. She began as a carer then progressed on to become senior carer, then deputy manager. She enjoys the team she works with, getting qualified, the job satisfaction and learning a lot. She has completed her NVQ Level 3 in Care and loves to be active. Her motto is, ‘Be yourself and love your life’. Joining the home in June 2005, Slawomir likes being around people, and finds the people at the home are a cheerful bunch. He used to work as a construction worker and roofer. He enjoys fishing, swimming and tennis and says that life is like a coin – you can spend it any way you like but you only spend it once. He is proud that he has a lot of experience and knowledge.